Do you use Foursquare? Personally, I am officially addicted to Foursquare. If you haven't jumped on the Foursquare bandwagon, here's a really good reason to try it! Foursquare, a location-based social networking site for mobile devices where users “check-in” at places through smartphones, text message or apps, is coming up with a special holiday for Foursquare aficionados – the much-anticipated #4SqDay! #4sqDay is all about community: reaching out to people through establishing business or personal relationships via social networking. #4sqDay or Foursquare Day is celebrated as a way of acknowledging the impact Foursquare has made in the lives of its users. With Foursquare, distance and differences are conquered, taking social networking to a whole new level. Foursquare Day activities vary in each locality. While some choose to celebrate the day through get-togethers and/or lectures, others do it the Foursquare way – a check-in. In the Philippines, however, a grand, global celebration is brewing. Aside from the meet and greet of Foursquare Superusers, this year’s festivities will even be bigger as Foursquare Philippines partner with SM Cinema’s e-PLUS along with SM Megamall, Starmobile and Papa John’s Pizza. For exclusive treats, make sure you unlock the #4sqDay 2013 official badge to get your own swags from Foursquare and a treat from Papa John’s Pizza. The first 200 who will present the #4sqDay 2013 badge at the event will be entitled to a treat from Papa John’s Pizza and the first 100 will be given limited edition Foursquare Day 2013 swag. e-PLUS will be raffling off flip cameras to lucky Foursquare Day attendees while Starmobile will be giving away a mobile phone. 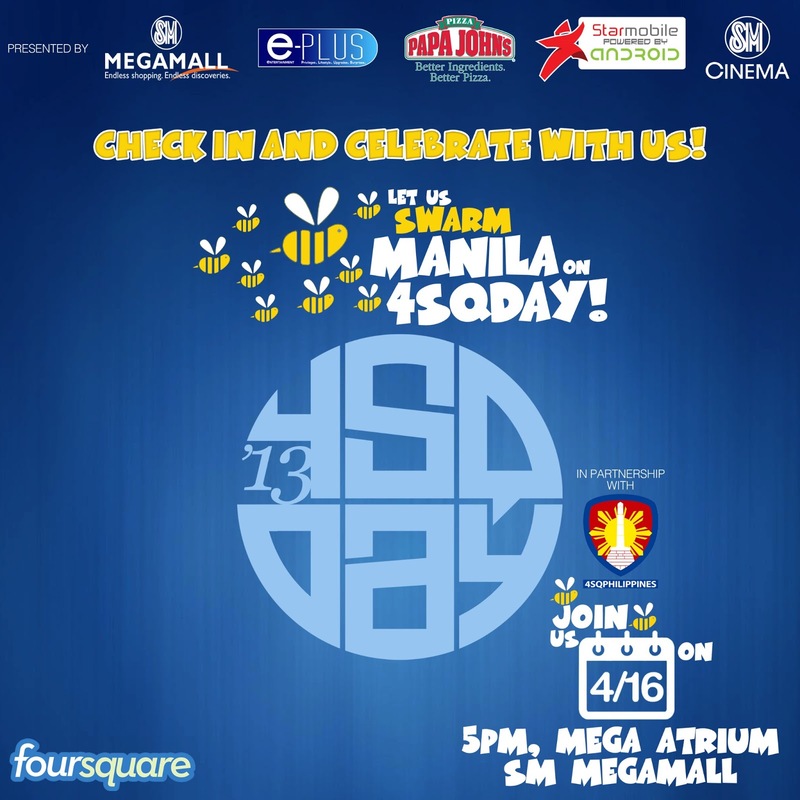 The Foursquare Day Philippine leg is made possible by SM Megamall, Starmobile, Papa John’s Pizza and e-PLUS card—your most convenient access to the movies. 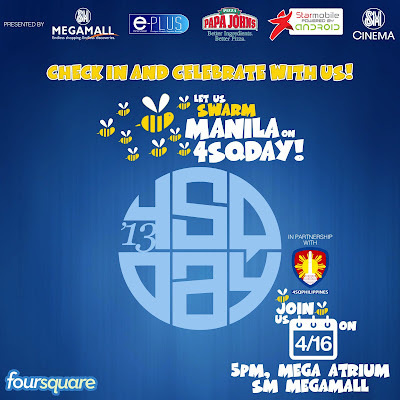 For updates, visit www.4sqphilippines.com or via Twitter: @4sqPhilippines with hashtag #4sqDay or #4sqDayPH. To learn more about e-PLUS, visit www.facebook.com/eplus.sm. Hello there! I could have sworn I've been to this web site before but after browsing through many of the articles I realized it's new to me. Anyways, I'm definitely happy I stumbled upon it and I'll be book-marking it and checking back regularly! Choose whether any of your constraints are holding you back or whether you could employ the aid of others to pack in the spaces. Regularly improve and update your products to enable you build a solid connection with your customers.